Hi I’m Grace and I went to Georgia for a month this summer, on my first European Voluntary Service ( EVS ). It was an amazing, and really worthwhile experience, and not only did I get to meet and work with some great people, I got to immerse myself in a different culture. 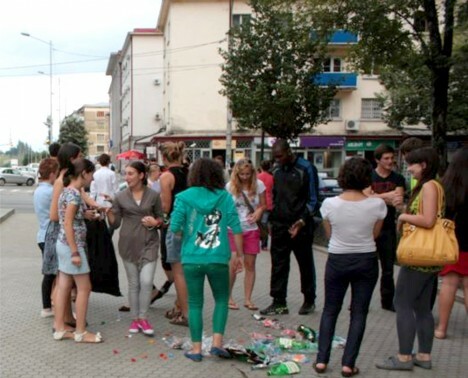 The project that I did was in Zugdidi, doing an eco-club in a local school. This meant running workshops with other volunteers from Europe for local children, organising flash mobs in the city centre and taking part in beach clean ups. The aim of this was to raise awareness of local environmental issues, such as looking after the beach, looking at how to recycle waste items and enabling the children to educate others. We also spent time educating them about our different cultures, as there were volunteers from Poland and Slovakia, as well as England. We received Georgian lessons, a few times a week. I really enjoyed these and they were incredibly useful, as many Georgians don’t speak English. We found that although the children who we spent time with were enthusiastic about the environment, many of the older generations were oblivious to the impact their littering had on the environment, and our group often saw litter being thrown to the floor instead of the bin. One of the flash mobs we organised involved us emptying large bags of empty bottles onto the street, where we then stamped on them and put them back in the bag. Actions like these seemed to get quite an audience, and were a fun way of getting a message across to the locals. It wasn’t all work though, and we had a lot of spare time to see more of the country. I took part in group excursions to a forest in the mountains, to local beaches, and a few of us hitchhiked to a monastery. I’m really glad I went on an European Voluntary Service ( EVS ) and would encourage others to do so, as even though my contribution was just a month, I feel that the children will have gone away with some valuable knowledge of how to look after the environment, and will be able to pass this on to others. Grace Wilkie, EVS ( European Voluntary Service ) volunteer in Georgia.